Recipes like this one are made for easy, no-fuss meals. It only takes a few minutes of prep and a very short cooking time – and the results are nothing short of phenomenal. 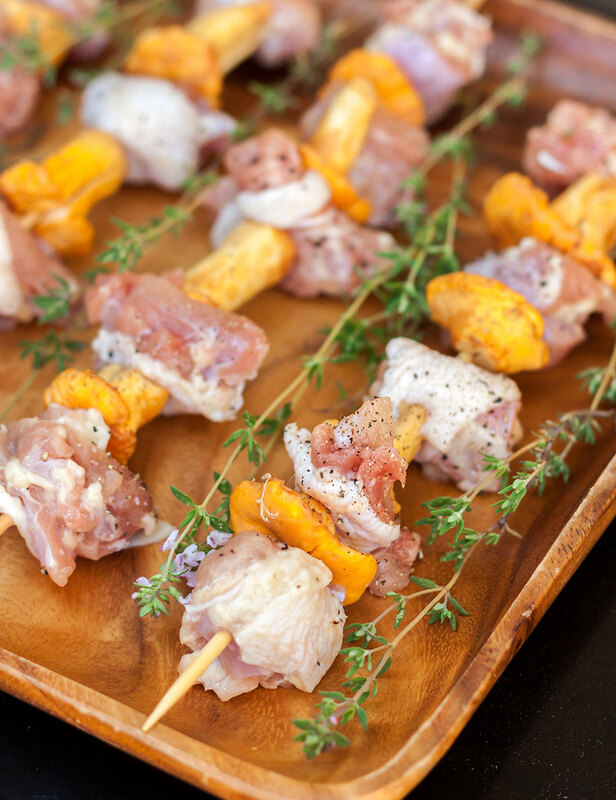 To transform simple grilled skewers of chicken into an elegant center of the plate showpiece, we alternated tender chunks of moist chicken thigh meat with firm, fresh whole “button” chanterelle mushrooms – then brushed the whole thing with a finger-licking sticky glaze. Fragrant thyme is frequently paired with fresh mushrooms, but the other ingredients are less conventional. Chanterelle mushrooms, already known for their natural affinity for fruity flavors, receive a flavor boost from a brushing with sweetly floral local wildflower honey, scented with a subtle touch of curry powder. And instead of the usual chicken breast, we used rich, juicy thighs – bursting with flavor and practically impossible to overcook. This meal – simple to make and a snap to cook – delivers mouthwatering results with very little effort. Isn’t that exactly the way grilling is supposed to be? In a small bowl, combine the honey, thyme, water, soy sauce, curry powder and 1/4 teaspoon pepper. Heat in a saucepan until bubbling, then remove from the stovetop and set aside to cool. Divide the honey-thyme mixture in half, reserving one portion for basting and the other for serving. Prepped and ready for the grill! Remove the bones from the chicken thighs with a sharp knife. (You can skip this step if you bought boneless thighs.) We like to leave the skin on, but it’s up to you. Trim away any excess fat and skin and cut the boned thigh meat into 1 1/2-inch chunks. Clean the chanterelles, either by brushing or rinsing quickly with cold water. Trim away any soft or brown areas. If the chanterelles are small (“buttons”), leave whole. If larger than 1 1/2-inch in diameter, slice them into halves or quarters. Heat a gas or charcoal grill on (moderate) medium high heat. Oil the grates well to prevent sticking. 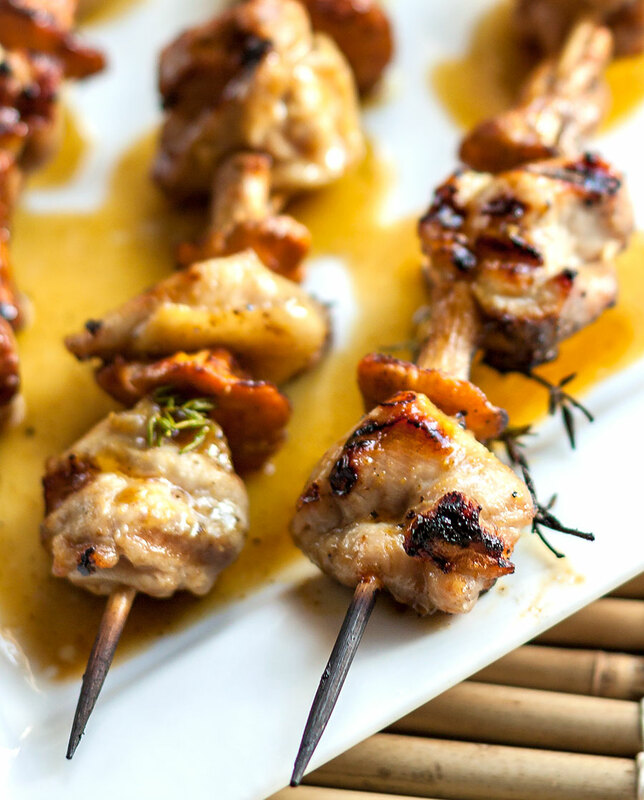 Slide the chicken pieces and chanterelles onto the skewers, alternating chicken & mushroom. If you left the skin on the chicken thighs, make sure that the skin sides face the outside. Brush with olive oil and sprinkle with a little salt and pepper. 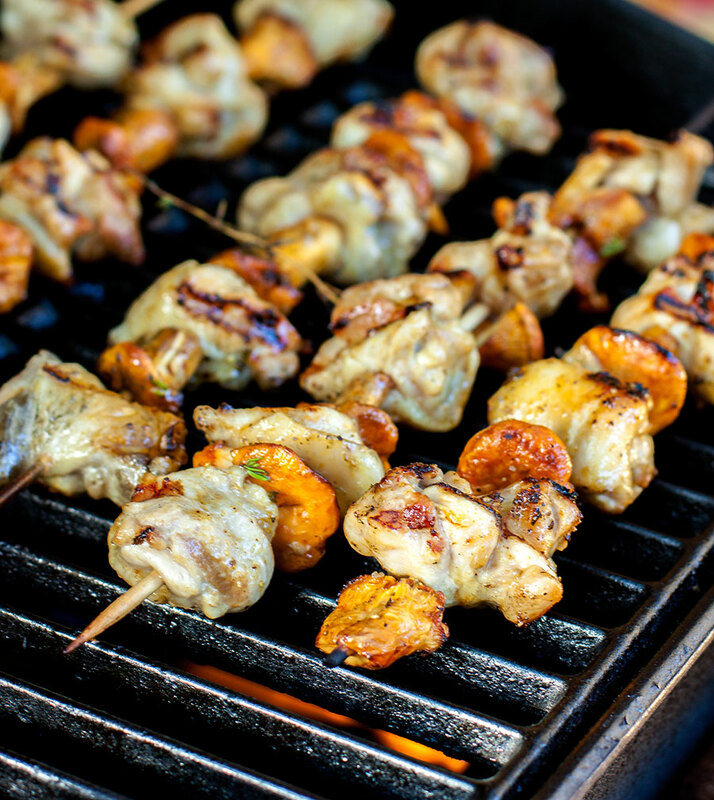 When the grill is hot, place the skewers on the grate, brushing with some of the honey mixture. Continue turning the skewers and brushing with the glaze until they are nicely browned and cooked through, about 12 – 15 minutes. Remove to serving plates and drizzle with the reserved honey-thyme mixture. Serve immediately.